New for 2018, the show will present 100% Futures - an exhibition showcasing a selection of inspiring and innovative designs geared towards ‘Designing for London’. Spearheaded by Max Fraser, a small jury will select 20 projects, created by designers with less than 5 years in industry who have designed cutting-edge work based around the future of city living. Alongside this, 100% Design brings together more than 400 international design brands as well as a range of innovative projects from the likes of Tesla and Riko with Starck. The highly coveted Talks at 100% Design will return for 2018, featuring keynote sessions by industry heavyweights, panel discussions, trend forecasts and more. 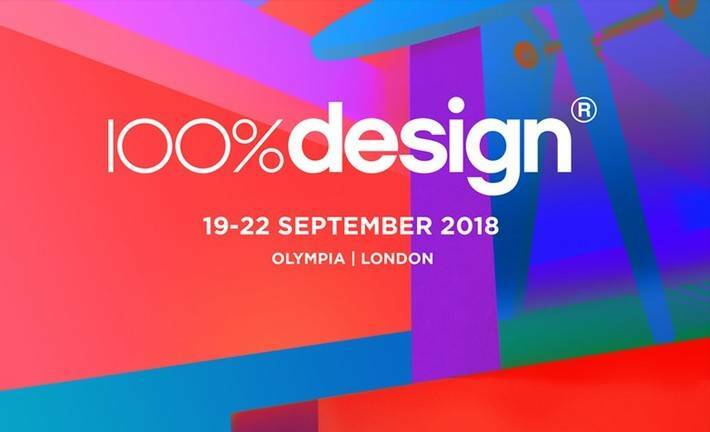 As part of 100% Design’s highly coveted seminar programme, BIID President Elect Harriet Forde will be chairing a panel discussion on ‘Starting Your Own Design Business.’ Taking place on Saturday 22nd September from 3.30pm to 4.15pm on the main stage, Harriet will be joined by BIID registered interior designers Emma Hooton and Daniel Hopwood. Be sure to check out BIID Industry Partner, furniture brand Arper, as they return to 100% Design with the Arper Social Hub, an inspiring and welcoming venue where digital professionals as well as visitors can come together, connect and share ideas. A central feature of the show, the Social Hub includes a showcase of iconic Arper designs within an engaging setting, perfect to be shared on social media and digital platforms. With free WiFi, charging stations and refreshments, it is a vibrant place to network and source useful information about the show. At the heart of the newly formed West Kensington Design District, 100% Design is the destination for architects and designers to source the latest products, discover new interior design trends and emerging brands. For more information about 100% Design please visit their website.